During the early part of the trip we saw just a few terns, but around 8:30am Martin Kennewell made certain we are all awake by shouting ‘petrel’! Then we were all able to see the first of several Swinhoe’s Storm Petrels for the day dashing close to the water’s surface and sometimes floating on the water. These oceanic birds are roughly the size of a swallow, but with their own distinctive flight pattern and affinity for the water. Swinhoe’s Storm Petrel breeds on rocky islands off the coast of north-east Asia and mainly winters in the Indian Ocean, naturally passing through the Singapore Straits on migration. Not long thereafter, we got another treat from the North, the first of several Aleutian Terns. These terns have a particular habit of perching on flotsam, whether it be pieces of wood or styrofoam. When perched on their floating platforms they have a characteristic stance with the tail held rather high. Until fairly recently, not much was known about the wintering grounds for the Aleutian Tern, and much still remains to be learned. However, we have now found that part of the population does spend some time in waters in and around Singapore and in the Riau Archipelago as well as other locations in tropical Asia. 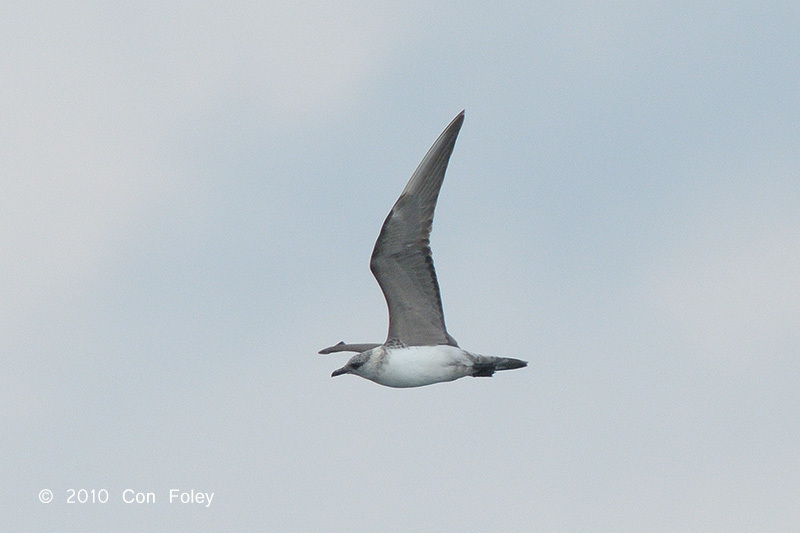 Not long after the excitement of the Aleutian Tern, we caught sight of a largish bird flying towards the boat. It quickly became evident that this was in fact another rarity, a Long-tailed Skua! Breeding in the Arctic, this species winters in the Southern oceans, so very likely this bird was just passing through. Altogether it was a very exciting day, with most participants recording several lifers. Other good birds seen included Lesser Crested Tern, Swift Tern (formerly Great Crested Tern) and Bridled Tern. During our next outing in mid November, the sharp eyes of Martin picked up another skua in the distance. This time it was a Pomarine Skua, and we were treated to a fantastic display of its behavior as it harassed a Swift Tern trying to get it to drop or regurgitate it’s food. 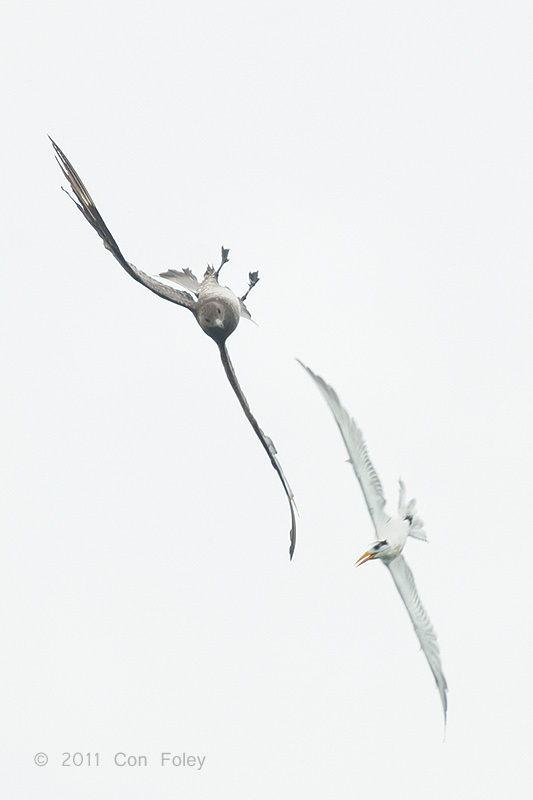 We were able to watch the pair in a dizzying aerial display that lasted a few minutes before the tern escaped. On this trip, the number of species seen declined compared with the October trip, missing were Bridled and Aleutian Terns and Swinhoe’s Storm Petrel, however another boat that was out on the same day did manage to see singles of the first two species and two of the latter. We did pick up a couple of Little Terns and one Common Tern. Our next monthly outing was in mid December, and the decline in number of species was significant, leaving us with just a relatively few Lesser Crested, Swift Terns and swiftlets. Such is the nature of bird watching, sometimes feast and sometimes famine. But in terms of gathering data, it is just as important to know when species are not seen, as it is to know when species are seen. The December trip was also the first trip which Geoffrey Davison arranged to be included in a year-long NParks survey of Singapore waters for biodiversity. Starting the new year on 15 January, we again headed out to sea. After a quiet December trip, we were anticipating another quiet trip, before return migration picks up later in the spring. And so it seemed the trip would go, with just a few crested terns of both species seen. We had just passed by a large yellow buoy on which a number of Lesser Crested Terns were perched and had taken flight. And then suddenly a large dark and light toned bird appeared directly over the boat and someone shout out Osprey, but it was no Osprey, it was an Arctic Skua harassing a Lesser Crested Tern and the tern was protesting loudly. Probably the skua had been nearby and when it saw the flight of terns leave the buoy it decided to try it’s luck. But the tern had no food, and eventually the skua gave up and came to perch on a chunk of styrofoam floating in the water. We were able to approach and observe the skua further before it finally took flight. And so, during just a few trips in the Straits of Singapore we were lucky to see the trio of skua species most likely to occur in these waters. What maritime wonders will future trips have in store? NOTES: A version of this article appeared in Nature Watch (a publication of Nature Society Singapore) Vol 19 No 3 Jul-Sep 2011. The Editor-in-chief is Mr. Morten Strange. Editor’s note: Skuas are members of the small family Stercorariidae, closely related to gulls (Laridae) and terns (Sternidae). There are only seven species worldwide, the three species mentioned here are called jaegers in some reference books, especially in North America. 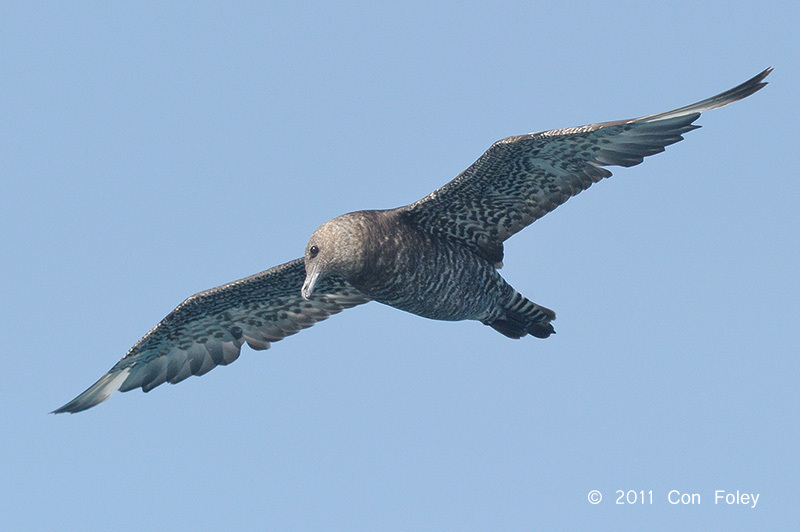 In fact, Lim (2009) uses the term jaeger, Parasitic Jaeger, for Arctic Skua, but skua for Pomarine Skua; the author’s nomenclature has been maintained here for ease of understanding and following Wells (1999). If approved by the NSS Bird Group’s Record Committee, the records for Pomarine and Long-tailed Skua would both be new species for Singapore; all three species are including in the official bird checklist for Indonesia. A special thank you to Colin Poole for helping out with proof-reading of the article. Lim, K. S (2009) The Avifauna of Singapore. NSS, Singapore. Wells, D.R. (1999) The Birds of the Thai-Malay Peninsula, Volume One: Non-passerines. Academic Press, London.